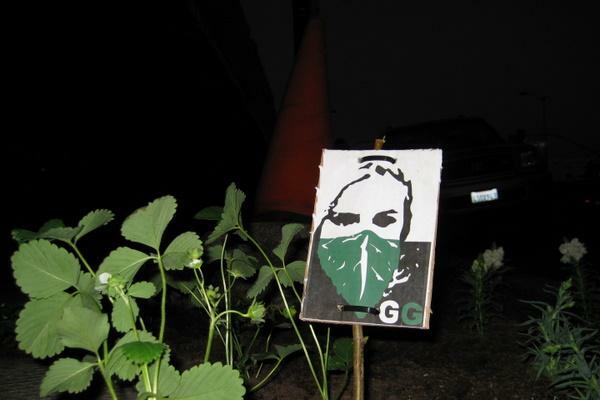 Guerrilla gardening is taking root in Chicago. One night last April, Diana Oppenheim committed a peculiar act of vandalism. Dressed in black clothing and bandannas, Oppenheim and three of her friends sneaked into the playground of Darwin Elementary near Logan Square. Their target sat in one corner of the lot, a wooden bench flanked by two empty planters. Armed with trowels and bags of potting soil, the four set to work. After 10 minutes of digging and transplanting, the formerly barren planters sported clumps of bright yellow daffodils. It was Oppenheim’s first experience with guerrilla gardening. Originally popularized in British gardener Richard Reynolds’ manifesto On Guerrilla Gardening, the guerrilla gardening movement is taking root in Chicago. Informal groups with names like Trowels on the Prowl and SOIL are taking horticulture to the streets, covertly planting flower and vegetable gardens in public lots and neglected planters around the city and its suburbs. Bit by bit, these Green Age graffiti artists aim to reinvent Chicagoland’s landscape, while making us take another look at how we use urban space. As might be expected, guerrilla gardeners don’t face the kind of opposition that their spray can cousins do. While Oppenheim does all of her gardening under cover of night, the 23 year old graduate student says she’s not worried about being caught (Oppenheim claims to have received “only positive reactions” from passersby). Instead, she says, she gardens at night to leave a morning surprise for neighbors. Charlotte Briggs, a.k.a. GenkiTango375, talked about guerrilla gardening’s fun factor. After discovering Reynolds’ book last year, Briggs, an academic administrator, banded together with neighbors Carla Hayden and James Moeler under the name Trowels on the Prowl. Since then, the three have planted on street corners and alleyways all around their neighborhood in the near north suburb of Evanston, announcing upcoming actions and taking credit for strikes under code names online. But Trowels on the Prowl’s actions do have a serious side. Briggs, Hayden, and Moeler practice guerrilla gardening as a type of community activism, planting in broad daylight in hopes of inspiring local residents to take ownership of their community by taking action. According to Moeler, as the trio continued to garden together, they began to realize that more passersby had started picking up litter in spots where the group had planted. Last year, Briggs, Hayden, and Moeler discovered what has since become their biggest battlefield, a vacant lot on the corner of Chicago and Main in Evanston. The lot was originally planned for development, the future site of a luxury condominium and retail complex. Late last summer, however, Cole Taylor Bank foreclosed on the land and stopped construction, leaving a bare field surrounded by a tall chain link fence. 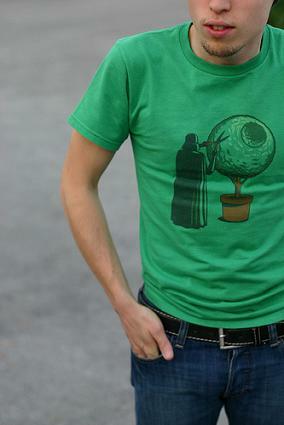 When Briggs and Hayden found out, they decided that the lot would be the perfect place to do some gardening. To get past the problem of the fence, they turned to one of the signature weapons of the guerrilla gardener: the seed bomb, a meatball-sized ball of compost, seeds, clay powder, and water that gardeners can throw over walls, fences, or other obstacles, enabling them to sow seeds in otherwise off-limits areas. In September, Trowels on the Prowl held a public workshop at Brothers K coffee house in Evanston, where community members helped to make over 700 seed bombs using donated seeds and scavenged flower heads. The following weekend, they met at Brothers K again before marching together to the lot and hurling the seed bombs over the fence using lacrosse sticks and slingshots. By spring, the lot was speckled with daisies, black-eyed Susans, Queen Anne’s lace and other wildflowers. When Briggs returned to photograph the lot this June, she found it freshly mowed. The flowers were gone, stripped out with the grass. Then, a few days later, a word appeared on the fence, the letters woven through the chain links in red and green ribbon: “Park.” For Briggs, it was a sign of a community mobilizing for action. As far as Trowels on the Prowl is concerned, the mowing was nothing more than a temporary setback. On July 8, the trio struck back, seed bombing the lot again and posting signs with anti-mowing messages like ‘Who’s killing the flowers?’ and ‘Let the prairie grow!’. With the group’s actions now garnering more attention, formerly uninterested Evanston officials have begun to speak up. On July 20, Evanston Alderwoman Melissa Wynne, who represents the ward containing the lot, told the Chicago Tribune that she thinks the guerrilla gardeners’ goals may be “unrealistic.” “I really don’t want to say, ‘Don’t mow the lot,’ because I don’t want it to look neglected,” Wynne told the paper. For her part, Briggs refuses to admit the possibility of defeat.